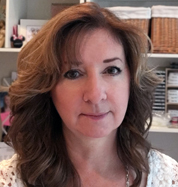 ← An Exciting MFT Annoucement! 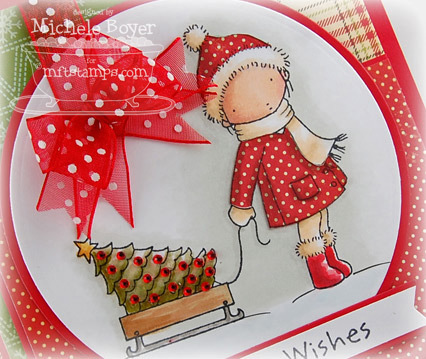 On my first card, I used Merry Kissmas along with Oval STAX, Traditional Tags STAX and Little Open Scallop Strip and Die-namics. After stamping and coloring my image onto X-Press It Blending Card (and paper-piecing the snowman’s hat and scarf), I die-cut using Oval STAX, matting onto Gumdrop Green cardstock. You can see better in this photo that I added a clear dimensional glaze to the berries, snowman’s nose and buttons. On the inside, I stamped an additional sentiment along with the berries, extending the branch line with a Copic multiliner. 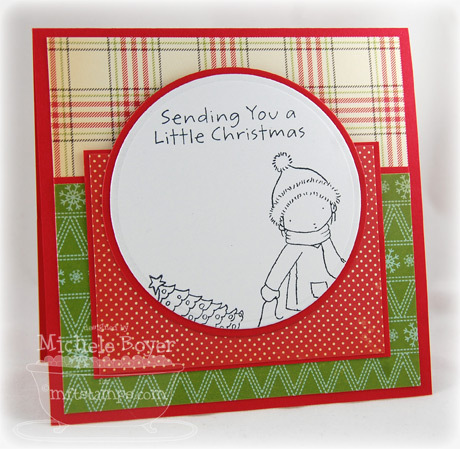 My second card uses another of my favorite holiday sets, Sending You a Little Christmas. The sentiment is from Presents for You. 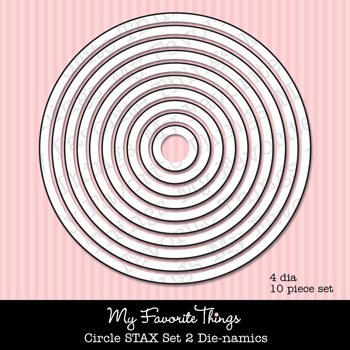 I also used Circle STAX as well as one of our new Sentiment Strips Die-namics. I pieced the girl’s hat and coat and used E50 and E51 to shade the “white” areas. The image was stamped onto X-Press It Blending Card (it’s my favorite) and matted onto Red Hot cardstock. 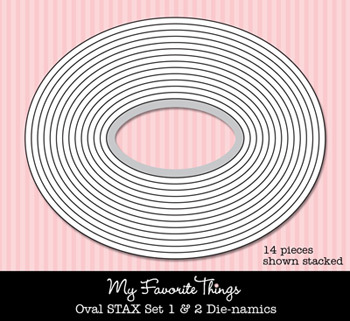 On the inside, I used more Circle STAX and left plenty of room for a short holiday note. Don’t forget to check out the MFT blog for more inspiration! Stamps: My Favorite Things “Merry Kissmas,” “Sending You a Little Christmas” and “Presents for You” (Pure Innocence) Ink: Memento Tuxedo Black Paper: MFT Gumdrop Green and Red Hot, X-Press It Blending Card, October Afternoon “Holiday Style” (8×8) Accessories: Copic markers (E00, E11, BV000, R20, E31, E50, E51, Y21, YR23, YG91, YG93, YG95, R22, R24, R89, W00, W1, W3, BG70, BG90), MFT Oval, Circle and Traditional Tags STAX, Sentiment Strips and Little Open Scallop Border Die-namics, Michaels rhinestones, brads, May Arts ribbon, foam boosters. 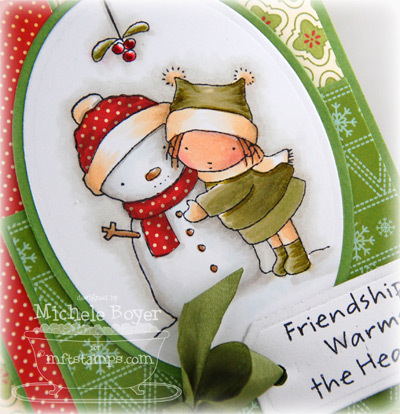 Friendship Warms the Heart finished size 4 1/4″ x 5 1/2″; Merry Wishes finished size 5″ x 5″. So adorable and beautifully made. Beatiful cards!!!! The colouring is phenomenal, especially the shading on the first one!!! OH I love these, Michele! 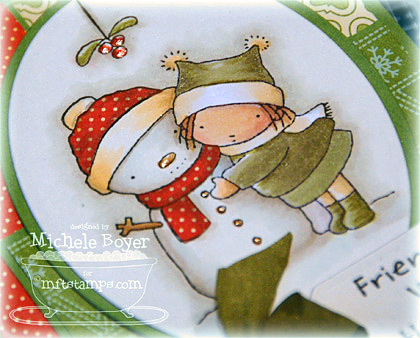 MFT holiday images are some of my fave out there. PI girls are so cute!! Oh My Lord, these cards are just fabulous! I so, so, so LOVE Christmas, it’s my favorite holiday and I love making Christmas cards. These cares are so beautiful!!! These are pure cuteness! 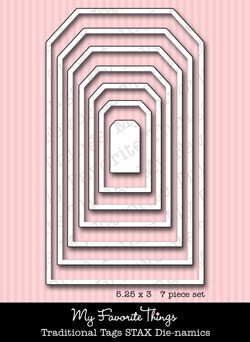 I love all the polka dot paper piecing! these are beautiful and sweet, love the colors and the beauty of the cards. so fabulous, Michele! love your coloring (always do!) and perfect ribbon placement on both. they are both absolutely adorable, but I will have to say I like the first one the most because I LOVE snowmen! oh these are awesome! love them! These are drop dead adorable!! Love them both and your coloring is out of this world!! Both of these are just fabulous, Michele! I love the papers you used on these! Gorgeous cards!